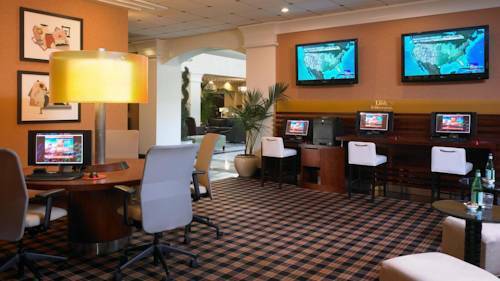 Discover the Sheraton Fairplex Hotel & Conference Center and experience the benefits of the picturesque locale near Ontario International Airport, Los Angeles, San Bernardino, and beyond. Ideally situated on 543 acres of rolling farmland in Pomona, California, our hotel offers 244 comfortable suites with enhanced amenities. Hit the gym at our Sheraton Fitness Center, or savor New American cuisine at our signature restaurant, McKinleys Grill. You can take in the breathtaking sights from our patio, plan a meeting in any of our expansive meeting rooms and plan the wedding of your dreams in our versatile ballrooms or outdoor settings with the help of our expert wedding planner. Plus, you wont want to miss our monthly farm-to-table dinners, for a true taste of Pomona. McKinley's Grille: McKinley s Grille proudly serves the finest in New American Cuisine. Chef Adam Haverland prepares his menus with peak of the season freshness, using a selection of the finest farm-to-table produce grown on-site at The Farm at Fairplex.